At the recent River CC meeting Andrew Purkis told his fellow councillors that he first raised the issue of stacking on the roundabout in October/November 2011. He said: “two and a half years and it is still not done right.” He detailed how there was still space for vehicles to stack on the roundabout in between the two areas now marked. The CC agree to write to BEAR with their concerns. Nail on the head there Stephanie. 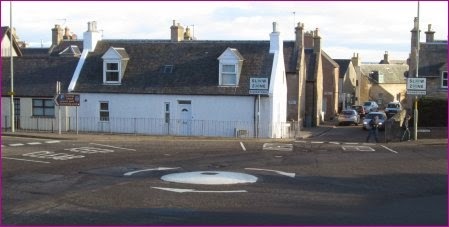 One crucial and significant omission is the lack of prominent "GIVE WAY" signs on the approach to the mini-roundabout from the Inverness/King Street direction. Far too many motorists travelling on the A96 assume they have priority going through the roundabout because they are driving on a trunk road. There have been numerous near misses between vehicles heading from the roundabout into Marine Road, and vehicles coming down in front of the URC church who simply don't stop. The risk is actually higher when traffic is light and there is no congestion or queues.